Lady Lola is a luxury motor yacht which has been built by the Oceanco Yachts. The yacht is available for cruising for the Mediterranean and it is a unique yacht which has innovative capabilities, superior technology and design. The interiors of the yacht are contemporary, modern and stylish and along with the furniture, design and the materials used throughout the ship, it fits in perfectly. The yacht has been made with precision and care and has enough attention to detail outside as well as inside the yacht. The design of the yacht has been done in such a way that it allows the guests to enjoy great views of the ocean with enough light and breeze. The upper deck is quite spacious and has an owner’s deck which is quite private with a soothing ambiance. The yacht also has a salon, a small office and private terrace. There are quite a lot of amenities on board along with outdoor entertainment like a pool along with waterfall, beach club, golf tee, outdoor cinema, private dining and several others. Quite a lot of these amenities are actually used for the first time in a yacht. Innovation and design are the two main strong points of Lady Lola and lay out has been very carefully designed. The technical details have been worked out with great care to ensure its reliability on sea and superior yachting experience. 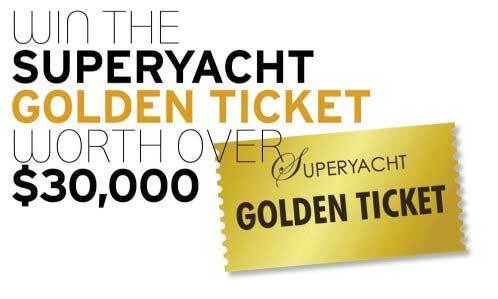 The golf system on board is the first ever to be used on a yacht and the pool with a waterfall too has never been used on yachts before. All of these minute details ensure that the guests on board have a super luxurious time yachting. Accommodation on board Lady Lola is comfortable and luxurious. There are five guest cabins on board which can accommodate up to ten guests. The master cabin covers the entire upper deck and has a king sized bed, shower and Jacuzzi, private decks, flat screen Television, a DVD player, study and private salon. The VIP guest room has a queen size bed along with various amenities like flat screen TV and DVD players. There are two queen guest cabins and one convertible cabin for the guests. Each cabin has ensuite bathroom. All of the guest cabins have been designed beautifully and are quite spacious and comfortable. The amenities in the cabins ensure that the guests have every form of entertainment available to them. There are quite a lot of extras and amenities available on board Lady Lola to ensure that the guests on board are entertained the best way possible. 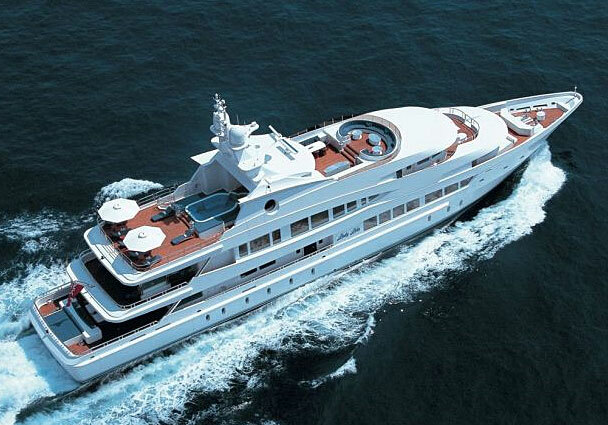 some of the toys and amenities available on board are a floating tennis court, heated pool, golf tee, dive compressors along with air tanks and regulators, jet ski’s, a Novurania Bombardier and StanCraft. The yacht also has modern communication equipment like fax, cell phone and Satcom so that you can stay in touch with the outside world. Lady Lola is definitely a very beautifully designed yacht.